Just a Quick Intro from Momma’s Bacon: I am really honored that Sukey Molloy asked if she could do a guest post on my blog. This is my first guest blog in almost 11 months of publicly blogging and I am very fortunate to have someone like Sukey (see my past review of her fab children’s CD, I Am Sleepy! here), a well-known children musician and all around cool gal, be my first guest. I hope you welcome her with open arms and, who knows, this may be a nice trend on my blog in the future. I certainly welcome more creative and fun guest’s that will talk and share great products for our kids! Welcome, Sukey! Take it away! Guided movement play gives children a special feeling of “I can!” and helps build important skills to take through life. Movements such as rocking, spinning and turning help children to develop good balance by stimulating the vestibular system. Movements like jumping, clapping and hopping help children strengthen joints, tendons, ligaments and muscles by stimulating the proprioceptive system. By creating opportunities for children to experience gross motor learning in an atmosphere of joyful play, we help them build self-confidence while having physical fun! The Tick Tock song was created for children to explore rhythmic motion while rocking from side to side like the pendulum of a clock. It invites children to try rocking, chiming, ringing, jumping, hopping, clapping and sleeping as they sing and move along. Tick Tock can be enjoyed as a full body movement song for children 2 – 5 years, or as a lap sit activity for pre-walkers. Enjoy! Check it out! Here is the video of Tick Tock clock for you to follow along with your child. Follow the italic indications as you sing and move. Tick tock, tick tock, it’s “ticking” on the dot. Tick tock, tick tock, it’s “ringing” on the dot. Tick tock, tick tock, it’s “chiming” on the dot. Tick tock, tick tock, it’s “spinning” on its top. Tick tock, tick tock, it’s “clapping” on the dot. Tick tock, tick tock, it’s “hopping” on its spot. Tick tock, tick tock, it’s “jumping” on its spot. Tick tock, tick tock, it’s “sleeping” on its spot. About Sukey Molloy: Sukey Molloy is a children’s music performer, award winning recording and video artist, and former professional modern dancer. Based in Nyack, NY, Sukey has studied Developmental Movement, Kidnastics, and Infant Development, and has designed and taught music and movement programs in nursery schools, after-school programs, and elementary schools. 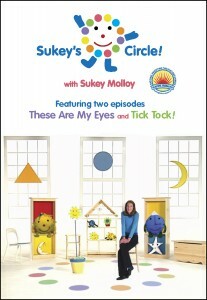 In 2005 Sukey launched her own program of “Mommy & Me” classes and teacher training workshops, creating PlayMove&Sing Inc. Sukey Molloy’s CDs and DVDs area available at www.sukeymolloy.com. Check it out! Click here to watch the Sukey’s Circle! Trailer (2 min).